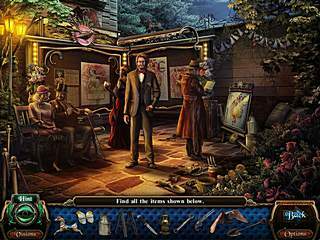 Macabre Mysteries: Curse of the Nightingale is the latest adventure/hidden object release. And I should say the game is really worth the attention of the gurus of the genre as well as of those who are at the point of finding out if this genre is their thing. Using this ability you can transport in time. This is fun, but there's more to the story. The major parts of the game do make it one of the few really good and addictive ones. 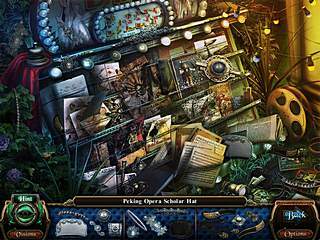 The story, the mini puzzles, the hidden object levels and the interactive parts are mixed together so very well. You play as a grandson of the old theater director. You will come to the old theater as was told to you by your grandparent in a note dated 30 years ago. As you arrive and explore the place you come across many strange things, some of which are ghosts and dead bodies. But the most peculiar thing about it all is that you actually meet your grandfather. What actually happens is that you discover that you possess a special gift of visualisation(or whatever that is called). Using this ability you can transport in time. This is fun, but there's more to the story. And to find that out you wil have to play all the wy through the game. And it won't be boring. The hidden object levels give you list of items, but the items are actually shown there. There are many little puzzles that tend to be such a natural part of teh general gameplay and the story. What I enjoyed about the adventure part is that you have to go from one location to another, but you will often find something new going back to a location where you already was. Or you will meet one of the ghosts over there this time. All of that together with the beautiful graphics and voice-overs make the game a very enjoyable experience. This is Macabre Mysteries: Curse of the Nightingale review. Download this game here.